Growing up in British Columbia, Canada, Angela (Duncan) Naeth, known in the triathlon world for her prowess on the bike, is a multiple 70.3 Ironman Champion, twenty-five 70.3 podium finisher, Ironman 2014 Chattanooga Champion (her third Ironman) and the 2015 North American Ironman Champion with her scorching under 9-hour performance! With a Masters degree in Physical Therapy and Bachelor’s in Health Sciences, Angela graduated in 2005 and worked as a pediatric and orthopedic physiotherapist for three years. In 2008, she competed in her first triathlon and shortly thereafter made the jump into full-time racing. Her recent victory in the Ironman distance was pivotal in her pursuit of punching her first ever entry ticket to the Ironman World Championships. 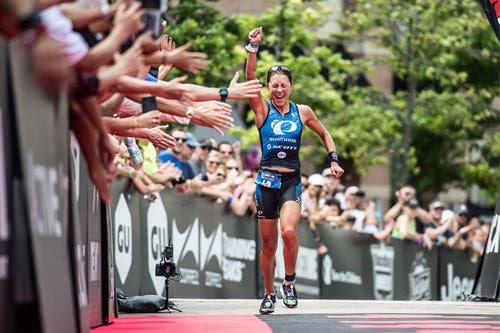 She is now focused on the Ironman distance already going under the infamous 9-hours in two Ironman competitions (including winning the North American Ironman Championships in 2015. When not traveling and training, Angela resides outside of Las Vegas, NV with her husband Paul Duncan. Angela trains on the Wahoo KICKR throughout the year which gives her a set wattage workout and realistic road feel. "Ever since I first went on the Wahoo Kickr I was hooked. I did a set indoor ride with a group and the ability to pre-set a workout via wattage was awesome. I was motivated the entire time and couldn't back out! It's definitely going to be my secret weapon for training." Q: What do you love about Wahoo? A: It's specific, and motivates me to complete a set workout. Q: What is your greatest accomplishment to date? Q: Favorite thing about training? A: Doing the work and the adventure on two wheels, sightseeing and traveling. Q: Least favorite thing about training? Q: Any good luck charms or race rituals? A: Always keep the race wheels unridden before race start! Q: Top 5 music tracks that you enjoy working out to? A: A difficult one! I love almost everything except the old country. ;) I change it up daily.